It was night and forty degrees and spitting rain. Seated in a puffy chair, I was warm and dry and comfortable. 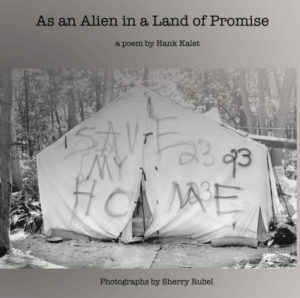 Then I opened As an Alien in a Land of Promise, a new collaborative effort between poet Hank Kalet and photographer Sherry Rubel. Shortly thereafter, I was irretrievably uncomfortable. The stark descriptions, along with characters who seem to tell their own stories, posed a problem for this reader. It confronted me, mostly on my preconceptions of myself. I know the problem of homelessness in America. I might even be considered part of the solution, what with my intermittent donations. Kalet and Rubel break the reader down, with hopes that a reconstruction will take place, for the betterment of all. I present this in such stark terms only because the book, comprised of an extended poem alongside Rubel’s photography, does much the same. small shoots of life in the empty woods. breath visible as the sun recedes. Some of the most affecting poetry is that which somehow speaks in the silence when the poem has ended, and Kalet achieves that here. The blank space after the poem seems to implicitly ask, Do you even care? Now what will you do about it? These are just a few of the questions that come to mind in the poem’s echo. This section, excerpted from early in the book, is where my discomfort set in, as the book continued questioning. I read from the confines of a barn-apartment with controlled air and unbelievable plumbing. I relate these details of my life because they are the answers to another question this book seems to ask the reader: Where do you live? Once answered, tension sets in, and one sees the excess that accounts for such a gap between the comfortable and the destitute. Read this, a passage based on interviews with residents of the makeshift camp, Tent City: “We don’t have a heater/ and the wind comes in. I had to take an old piece of carpeting I found/ and put it under the venting,/ Wedged in by the frame.” There’s a coolness here on Kalet’s part. That is, the reader is well considered; I feel as if I’ve been given the space to scream, both at myself and the powers that be, for not doing more to help those without a warm dry place to sleep. Read this, and open Pandora’s box. You’ll possess a saddening knowledge you can’t get rid of. I fell asleep that rainy night, my head dry like old bread. I woke up the next morning and picked the book up again, only to ask, Am I a bad person? Please know I resisted reading in this manner, trying always to keep an eye towards what the words are doing in lines like this: “shelter, protection/…/ maybe the trees, the tarps,/ the tents. perhaps the cops,/ or not, or the courts./ maybe the plywood/ or a sleeping bag, a rough mattress/ on a rotting pallet,/ the leftovers, waste,/ no-longer-wanted, donated.” But the book seems to resist this kind of reading. Each time I began to think in terms of craft, the poem or the photographs brought back to mind just how high the stakes are. Rubel has an eye for the ironic. The tent-homes, in various states of disrepair, are watched over by an unsullied American flag; a woman stands before her tent in house shoes. But the power of the pictures lies in the faces captured: a middle-aged man’s suspicious mouth and eyes; a young man’s chin lifted along with his vodka bottle. The book ends with a photo: Thick New Jersey woods backgrounded. In the fore, a sign on a wooden post that reads, “Bible Study.” Paint-chipped figurines of Mary and Joseph kneel before a pile of grass and bark. They might have once been part of a nativity scene. But the main character of that scene is missing. The child that preachers talk about, the one that grew up and catered to the least of us; he’s gone. More questions arise: Is he out doing good works? Should I follow? Is he not around? Is helping those with nothing up to us? To me? This is the part where you say I’m reading myself into it, injecting melodrama that isn’t there. Maybe. But if you haven’t gotten it yet, I’ll say again: That’s the point. Kalet and Rubel craft behind the scenes; there’s the people who are the subject of this book, and there’s the reader. Face to face. This book, like any other, is not without its holes — there’s a gaping one on every page. Thankfully, they’re all reader-sized. Hayden Bergman lives in Abilene, Texas. He is an MFA candidate at Fairleigh Dickinson University.